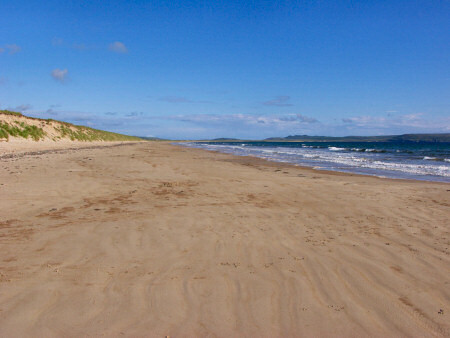 Contrary to popular rumour which puts it at 7 miles it only seems to be 5 miles long (measured on my Ordnance Survey Explorer Map Islay South), but it's still a very long, very clean and in particular spacious beach. Sure, there is some stuff washed up from the sea, but then volunteers clean it fairly regularly and in particular you don't get many visitors dropping litter. You get great views over The Oa and the Rhinns thrown in as well. There are a few more nice beaches on Islay (as well as Jura and in particular Colonsay), I'll post more pictures in future entries.